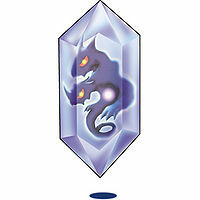 Existing within Millenniumon's inner world, it is a soul Digimon. As a result of Millenniumon's dark spirit becoming a Digimon, it does not possess a fixed form. Although it often takes the shape of a crystal, it seems that, due to its hatred and anger against the enemies who oppose it, that shape can be changed. Also, as a soul it does not have substance, and so it is immune to physical attacks. To defeat Moon Millenniumon, one must first defeat Millenniummon, its true form, but it's likely there are virtually no Digimon who are up to that task. Also, even if by some chance Millenniumon is defeated, it is said that it will separate from its now-dead true form and be revived throughout time and space. 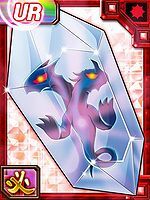 Its Special Move is "Death Crystal", and while it does not possess a corporeal destructive force, it is said that it chops up the opposing Digimon's spirit. | Millennium means 1000 years. Anime/Manga Digimon Xros Wars: "Xros Apocalypse!! The Beast of Revelation!!" 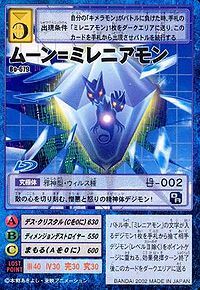 Death Crystal  デス・クリスタル Desu Kurisutaru Chops up its enemy's soul with discs of incorporeal energy. Dimension Destroyer  ディメンジョンデストロイヤー Dimenshon Desutoroiyā Fires a powerful energy beam. Killer Light  キラーライト Kirā Raito Uses a powerful flash to blind the enemy. Crystal Drop  クリスタルドロップ Kurisutaru Doroppu Rams the enemy with its body. Moon Millenniumon appears inside Zeed Millenniumon, housing the souls of Shademon and Nene Amano. Moon Millenniumon is destroyed alongside Zeed Millenniumon when the DigiXros that created it is reversed. 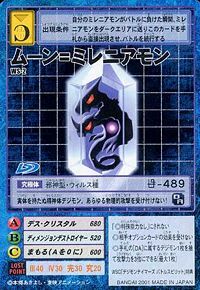 Can be evolved from Chimeramon if above level 66, spirit 370, and already befriended Millenniumon. During the Silver Rank test at Digi-Colosseum, Wanpui will be using Moon=Milleniumon in battle, alongside with Vademon and Parasimon. Moon Millenniumon is only obtainable as a collectible card. 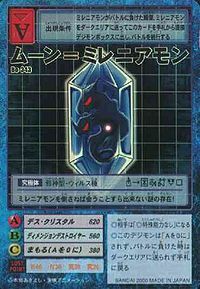 Its card is part of the Millennium (ミレニアム Mireniamu) set. Moon Millenniumon is available as a Digimon Medal. A mysterious being who is impossible to even meet without first defeating Millenniumon! This spirit Digimon of hatred and anger mangles the hearts of its enemies! A soul Digimon that lacks a physical form. It is immune to all physical attacks! ↑ Digimon Xros Wars: "Xros Apocalypse!! The Beast of Revelation!!" This page was last modified on 14 April 2019, at 22:32.